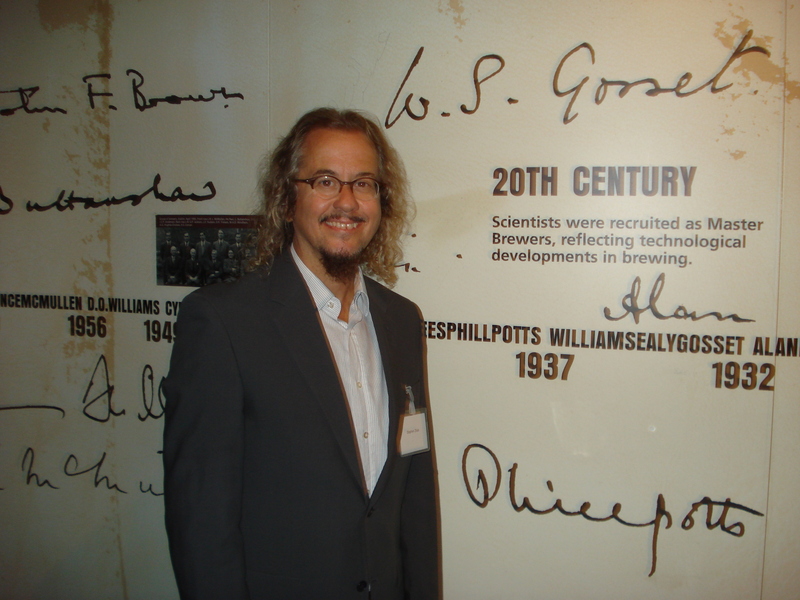 THE GOSSET LABORATORY is an evolving sample of articles, chapters, lectures, and reviews on William Sealy Gosset aka “Student” (1876-1937), by Stephen T. Ziliak. 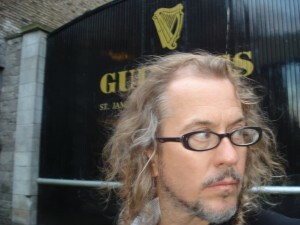 For additional articles, chapters, reviews, lectures, and interviews, visit stephentziliak.com. 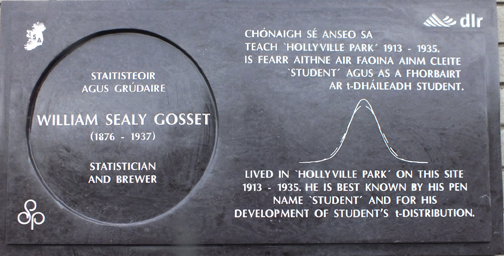 This plaque in honor of William Sealy Gosset aka “Student” – he of Student’s test of significance – is now displayed near Student’s family home of many years, in Dublin, Ireland. * “Recommended economics writing” by The Economist (July 20th, 2011) and “Statisticians in the News”, by the American Statistical Association. Gosset aka “Student” inspired article on the trouble with the so-called “gold standard”: significance testing and randomized trials in medicine, field experiments in economics, and other areas: Stephen T. Ziliak, The Validus Medicus and a New Gold Standard, The Lancet 376, No. 9738 (July 31, 2010): 324 – 325. 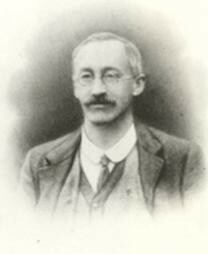 Reply to Stephen Senn: “Significant Errors – Author’s Reply,” The Lancet 376, No. 9750 (Oct. 23, 2010): 1391. Article introducing Gosset aka “Student” on statistical significance, randomization, balance, and the economic approach to the logic of uncertainty: “Guinnessometrics: The Economic Foundation of ‘Students’s” Journal of Economic Perspectives 22 (4, 2008): 199-216. 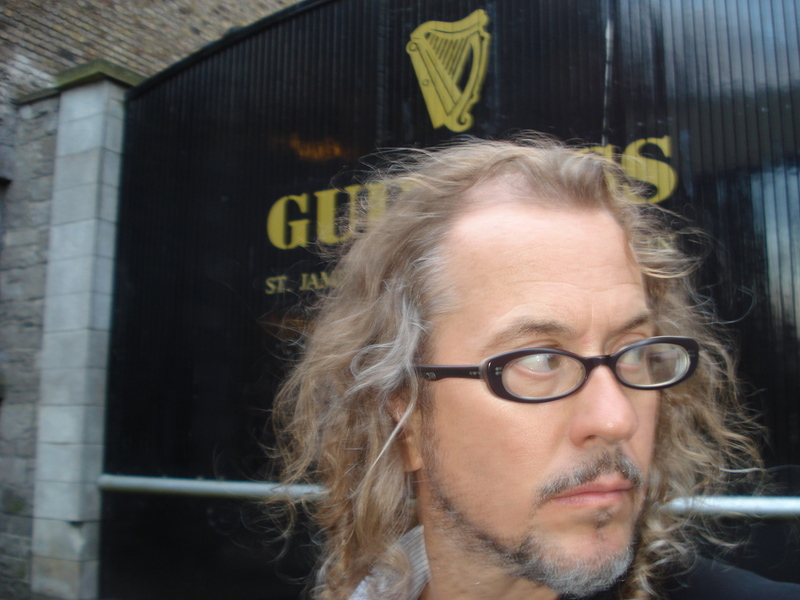 See also: Tim Harford (aka “The Undercover Economist”), “Enlightened Research Fueled By The Dark Stuff,” Financial Times, Feb. 7, 2009. Tim Harford, “Statistical Significance,” BBC Radio 4, “More or Less” program, interview, Feb. 2, 2009. Tim Harford, Statistical Significance and a U.S. Supreme Court Decision (Matrixx v. Siracusano), BBC Radio 4, “More or Less” program, interview, April 15, 2011. Kevin McConway, Statistically Significant: The US Supreme Court Takes a View, OpenLearn, Open University (Milton Keynes, UK) in cooperation with BBC Radio 4’s “More or Less”, hosted by Tim Harford. Carl Bialik (aka “The Numbers Guy”), “Making a Stat Less Significant,” The Wall Street Journal, April 2, 2011, p. A5. Carl Bialik, “A Statistical Test Gets Its Closeup,” The Wall Street Journal, The Numbers Guy blog, April 1, 2011. 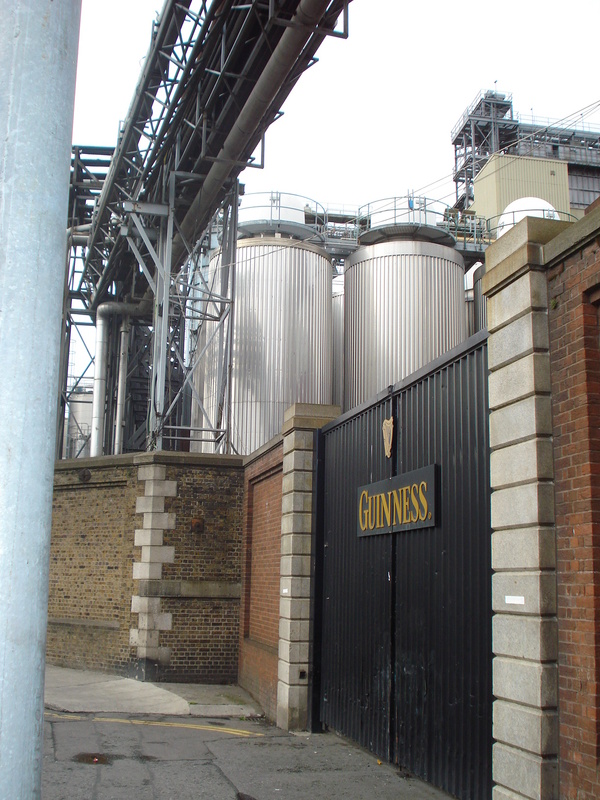 Read more about Gosset and Guinnessometrics in the Feb. 8, 2012 issue of The Washington Post, “Guinness’s Big Contribution to Economics Research;” in the Feb. 9, 2012 issue of Chicago Magazine, “Guinnessometrics: Saving Science and Statistics with Beer;” in the Feb. 8, 2012 “Recommended economics writing,” at The Economist; in “The Statistical Significance of Beer,” at Freakonomics; “Beer and Stats,” at The University of Michigan Press Blog; “We Know Now,” at The Irish Times, “In the News,” at the American Association of Wine Economists, and “Beerometrics: Econometrics and the Science of Beer,” at Beeronomics. 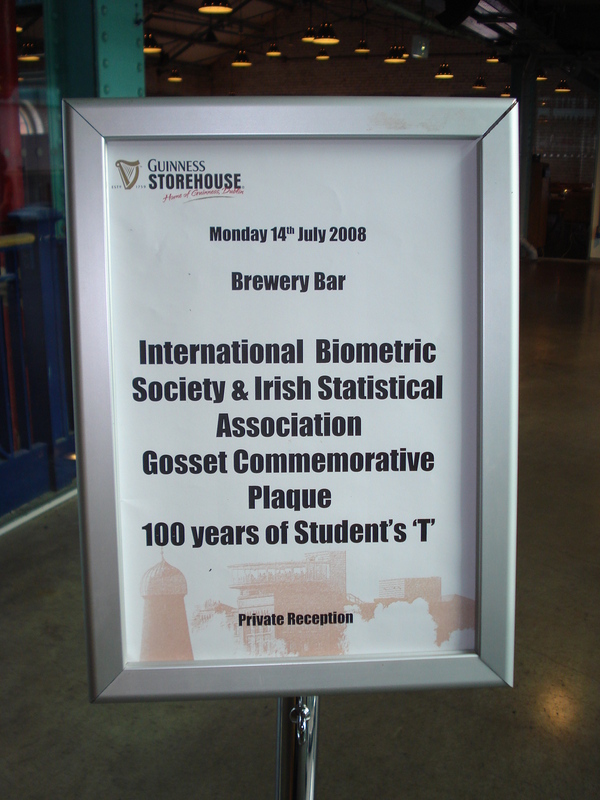 Prepublication version reviewed by: Andrew Leonard, “Celebrate the History of Statistics: Drink a Guinness – How a Master Brewer Forged New Ground in the Quantitative Progress of Science,” Salon, Sept. 28, 2009; see also: The Economist, “Guinness is Good For You, If You’re a Statistician” (Sept. 28, 2009) and Mark Thoma’s Economist’s View, “250 Years of Clever Counting” (Sept. 27, 2009). 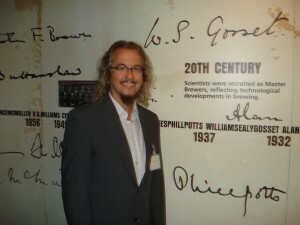 Book chapters on Gosset’s seminal contributions to econometrics, statistics, and experimental science, and how they were neglected by scientists after Fisher: Ziliak’s and McCloskey’s, The Cult of Statistical Significance: How the Standard Error Costs Us Jobs, Justice, and Lives (University of Michigan Press, 2008). See, especially: Introduction, Chapters 1-3, 20-24. Praise for the book, here. Article and special lecture:Supreme Court Finds Statistical Significance Is Not Necessary for Causation Matrixx v Siracusano Student v Fisher_Ziliak PDF, Late-Breaking Session, Joint Statistical Meetings (JSM), 2011, Miami Beach, FL. Panelists: Stephen T. Ziliak, Joseph “Jay” Kadane, Daniel Kaplan, and Donald Rubin. The article is: Stephen T. Ziliak, “Matrixx v Siracusano and Student v Fisher: Statistical Significance on Trial,” Significance 8 (3, 2011), published by the Royal Statistical Society and the American Statistical Association, pp. 131-134. See also: Brief of Amici Curiae by Statistics Experts Professors Deirdre N. McCloskey and Stephen T. Ziliak in Support of Respondents [Siracusano] (vol. No. 09-1156, pp. 22). Washington DC: Supreme Court of the United States. With Edward Labaton et al. Counsel of Record (Ed. ), Matrixx et. al. v. Siracusano and NECA-IBEW Pension Fund, filed Nov. 12, 2010. Article (with D.N. McCloskey) on Gosset and the future of statistics: “The Cult of Statistical Significance,” Proceedings of the Joint Statistical Meetings, 2009 (Alexandria, VA: American Statistical Association): 2302-2306. Text of Ziliak’s “Highlight Lecture”, Joint Statistical Meetings, Washington, DC, 2009. Article (with D. N. McCloskey) on Gosset, Fisher, and Bayesian statistics in biology and especially medicine: “The Unreasonable Ineffectiveness of Fisherian Tests in Biology, and Especially in Medicine,” Biological Theory 4(1, 2009): 44-53. 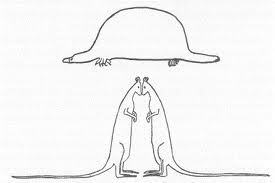 Konrad Lorenz Institute for Evolution and Cognition Research, The MIT Press. Keynote Lecture: “Guinnessometrics: The Economic Foundation of ‘Student’s’ t,” 1st Conference on Beeronomics: The Economics of Beer and Brewing, Katholieke Universiteit, Leuven, Belgium, May 29, 2009. Videotaped by The Wall Street Journal Europe, Future Leadership Institute, May 29, 2009. 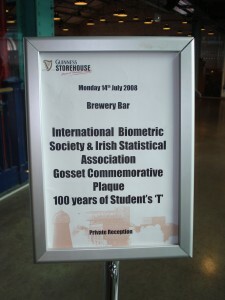 Special Invited Lecture on “Guinnessometrics: The Economic Foundation of ‘Student’s’ t,” Gosset Centenary (100th Anniversary of Student’s distribution, table, and test of significance), International Biometric Society and Irish Statistical Association, University College Dublin, July 16, 2008. Panelists: James Hanley, Stephen Senn, Stephen Ziliak, and Sir David Cox; Organizer: John Hinde. Article (with D.N. McCloskey) on the misuse of significance testing in econometrics: “Size Matters: The Standard Error of Regressions in the American Economic Review,” The Journal of Socio-Economics 33 (2004): 527-546. Text of Plenary Lecture, “The Culture of Statistical Significance,” American Economic Association and Allied Social Sciences Association (ASSA), San Diego, Jan. 2004. Panelists: Stephen Ziliak, Deirdre McCloskey, Sir Clive Granger, Joel Horowitz, Ed Leamer, Anthony O’Brien, Erik Thorbecke, Arnold Zellner; Chair: Kenneth Arrow, Organizer: Morris Altman. Reply (with D.N. McCloskey) to critics Sir Clive Granger, Graham Elliott, Joel Horowitz, Ed Leamer, Anthony O’Brien, Peter Lunt, Erik Thorbecke, Jeffrey Wooldridge, and Arnold Zellner: “Significance Redux,” The Journal of Socio-Economics 33 (2004): 655-675. Article (with D.N. McCloskey) on misuse of statistical significance in economics: “The Standard Error of Regressions,” Journal of Economic Literature 34 (March, 1996): 97-114. Reply (with D.N. McCloskey) to critics Hoover and Siegler: “Signifying Nothing: Reply to Hoover and Siegler,” Journal of Economic Methodology 15 (1, 2008): 39-55. Reply (with D.N. McCloskey) to Aris Spanos: “Science is Judgment, Not Only Calculation: A Reply to Aris Spanos’s Review of The Cult of Statistical Significance,” Erasmus Journal for Philosophy and Economics 1 (1, 2008): 165-170.